Tactical portable FRA1530T antenna designed for multi frequency medium range communication. For installation as flat top, inverted"V", delta or sloper. Easy to install by one person. Construction for any climate use. Low weight, small size 35x15x15 cm. Recommended antenna height 5 meters or more. cable with BNC termination. The choice of fixed frequency using dipole function and wire lenght is up to user. Balun transformer is fitted into the bottom of central rod in order to completely SO239 connector. 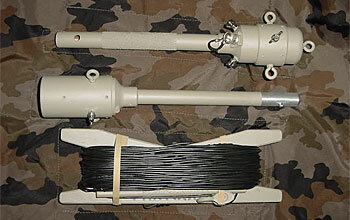 och The antennas low VSWR ratio (Depending upon installation) means it can be used for military or commercionaly available transceivers for radiocommunication. The antenna-system`s parameters means that VSWR and efficiency remain within approved limits. No antenna tuner required. Color: olive green, tan, neutral or uncoloured on request. Antennas performance has been tested by Aerotech Telub laboratory, Sweden.